Create a special look for the water closet, powder room or The Vintage Bath with our selection of vintage inspired decorating ideas. 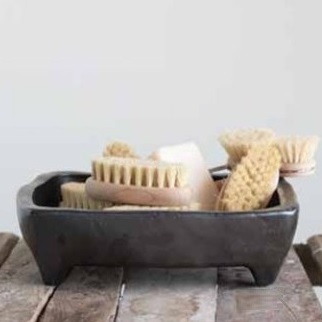 Use our rustic bathroom decor ideas to make over your bathroom with a relaxed flea-market feel. The Distressed Metal Cabinet With 3 Drawers looks like an old nurse's cabinet for a touch of nostalgia, and the Metal Wire Basket, Set of 2, with a hook below on each, is perfect for a soap holder and hand towel. Finish off your decor with the In This House White Enameled Sign for some welcoming wall art.